Great design! Well NYC is sure moving on the right direction with mix public places these days...Alot of glass not just concrete or brick walls like designs from the 60's and 70's look at MSG what a dissapointment. Saying that MSG is a "disappointment" is the most severe of understatements. This is the first briefing in the Municipal Art Society's Engaging Lower Manhattan series, which is designed to keep people aware and up-to-date on planning efforts in Lower Manhattan so that the public can help shape the results. For more information or to RSVP, email syackel@mas.org. Wednesday, April 28, 6:00-8:00 p.m.
Are you wondering what’s happening in Lower Manhattan? Are you curious about the status of rebuilding efforts? If so, join us for the April 28th kickoff of the Municipal Art Society’s Engaging Lower Manhattan, a series of public briefings aimed at increasing the public's understanding and ability to participate in the planning for Lower Manhattan. With its focus on bringing the public into the planning process, Engaging Lower Manhattan follows in the trail blazed by programs like Imagine New York. At our first event, William Wheeler, the MTA's director of special project development and planning, will speak about the MTA's Fulton Street Transit Center Plan from 6:00 - 8:00 p.m. at St. John's University's Lower Manhattan campus. Participants will not only learn about the new transit station at Fulton Street, but also how to affect the process when the Draft Environmental Impact Statement is released in April. Representatives from Manhattan Community Board 1, the Civic Alliance, the Lower Manhattan Emergency Preservation Fund, and New York New Visions will be on hand to engage in an open discussion with the MTA and the public. RSVP to 212.935.3960 or syackel@mas.org. Also, the low building on the SE corner of Fulton &amp; Broadway has been cleaned up (looks pretty good), a Sleepy's Bedding has moved into the 2nd floor with a "Grand Opening" banner. I wonder how long they expect to be there? Pataki said the MTA will reveal the new station design on May 26. 100 Downtown Business to be Evicted for this Building! This week, the Metropolitan Transportation Authority will unveil its design for the Fulton Street Transit Center. It's expected to be as grand in scope as the design for the nearby World Trade Center transit hub. But for the businesses in buildings that will have to be knocked down to make way for the project, there is more resentment than excitement. “We kept the place up and running. They were worried about businesses leaving en masse after 9/11, and now it's like a slap in the face,” said Jim Boudouvas, the owner of New York Blossoms, Inc.
Boudouvas' flower shop is one of more than 100 businesses that will likely have to relocate. The buildings being torn down range from one to 12 stories and are home to several chain stores, including a Modell's that is already scouting for a new location. But some smaller businesses may not be OK. Mirza Mamur moved his art and frame store five months after the September 11, 2001, attacks, banking on the idea that things would get better Downtown. “I made my customers, the economy is getting better, I can feel the economy getting better with the business, and now we have to move again,” he said. The MTA will help businesses with the cost of relocating. The agency also says that because of high vacancy rates in the area, they shouldn't have trouble finding a place to move. But unlike businesses on the Upper East Side that recently got letters warning about the impact of the Second Avenue subway, these businesses have gotten almost no information up to this point, and they seem to have little trust they'll be taken care of. The design for the transit center will be unveiled Wednesday at a meeting of the American Institute of Architects. Then business owners and anyone else wanting to comment will get their say at a public hearing on June 8. Planned Fulton Street transit center. A scene from Broadway and Fulton Street. Add another transparent polymorph to downtown's future landscape. If blueprints can be believed, office towers, apartment houses, commuter rail terminals - and now, even a subway station - will shimmer luminously as they taper and soar. Astride a tangled labyrinth linking four stations on the A, C, J, M, Z, 2, 3, 4 and 5 lines, the Metropolitan Transportation Authority proposes a tapering, conical, 110-foot-tall steel-and-glass dome that would emerge from within a 50-foot-high glass-box pavilion at Broadway and Fulton Street. This translucent and transparent structure would, in effect, harvest daylight and send it as far as possible underground, opening new vistas and brightening what is now a dank warren of platforms and passageways. The design of the $750 million Fulton Street Transit Center, to be completed in 2007, will be unveiled today at the Center for Architecture in Greenwich Village. A public hearing on the draft environmental impact statement is scheduled for June 8. The architect is Grimshaw, a firm founded by Sir Nicholas Grimshaw, working with Arup, James Carpenter Design Associates, Daniel Frankfurt, Lee Harris Pomeroy Associates and M.T.A. staff members. Under their plan, a new 350-foot-long concourse beneath Dey Street would link the Fulton Street stations to the PATH trains and the E, the R and W and the 1 and 9 subways at the future World Trade Center transportation hub that is being designed by Santiago Calatrava. Two platforms would be rehabilitated and an east-west mezzanine would be renovated and simplified. But the signature of the new transit center will be the dome, with its 50-foot-diameter oculus skylight and its crisscross framework of curved, diagonal facets. Apart from elevated lines and control houses, like those at Bowling Green and 72nd Street, it would be one of the few distinctive aboveground structures in the 100-year-old subway system. And it is intended to be a landmark for pedestrians, far easier to find among the crooked streets of Lower Manhattan than the current entrances to the Fulton Street platforms, many of which are tucked into other buildings. "I'm really a little breathless about it," Peter S. Kalikow, the chairman of the M.T.A., said yesterday after he was shown the models. "It's perfectly juxtaposed to what's going on at the World Trade Center. It makes what was a mess into something beautiful." The oculus may remind some viewers of the Pantheon. The convex taper may recall the form of ancient sikhara spires in Indian architecture or Norman Foster's new Swiss Re headquarters in London, better known as the gherkin. New Yorkers, never shy about nicknaming unusual architecture (the Tombs, the Church of the Holy Zebra, the Lipstick Building) may find it hard to resist thinking of this structure as a jeweled egg to Mr. Calatrava's birdlike terminal. From within, the center's design is intended to help wayfinding. For instance, St. Paul's Chapel will be visible from the mezzanine level, greeting arriving riders from seven subway lines. "St. Paul's is a major orientation point," said William Wheeler, the director of special project development and planning at the M.T.A. "When you come in and see the church, there's no mistaking it." But the pavilion will not be entirely see-through. There will be small stores on both Broadway and Fulton Street. "The community has said that retail and some modest commercial activity that restores street life is important," Mr. Wheeler said. Construction will require the acquisition of every building on the east side of Broadway between John and Fulton Streets. The nine-story, 115-year-old Corbin Building will be preserved and incorporated into the center. Travelers will be able to enter the center through restored arches in the base of the Corbin Building and pass by the inverted arches that form its foundations, which will be exposed to view. Other properties along Broadway, including a former Childs Restaurant and the 102-year-old Girard Building, will be razed. The state also plans to acquire a two-story building at 189 Broadway, occupied by the World of Golf store, to create a street-level entrance to the Dey Street concourse, which may have moving walkways. The new transit center will be an amenity for tenants in the former American Telephone and Telegraph building at 195 Broadway, which Mr. Kalikow owns. He said he had reviewed the matter with the State Ethics Commission, had not participated in daily meetings on the project and had not discussed it with Mysore L. Nagaraja, the president of the M.T.A. Capital Construction Company. "We bought this building because it sits on the hub of all that transportation," Mr. Kalikow said, likening it to another H. J. Kalikow &amp; Company building, 101 Park Avenue, near Grand Central Terminal. "I didn't buy this building in 1983 and say, 'Just think - in 21 years, I'm going to be chairman of the M.T.A. and there's going to be a great station.' "
Gene Russianoff, the staff attorney of the New York Public Interest Research Group Straphangers Campaign, said he was convinced that Mr. Kalikow had kept an appropriate distance. "The idea had more than one author, and the project is a meritorious one," Mr. Russianoff said. "He's right: he's a smart man for buying a building at a transit hub." 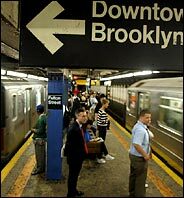 About the current state of the stations, Mr. Russianoff said, "It's misery for riders - clogged entrances, confused passageways, congested platforms and a crazy quilt of connections." He said the Straphangers Campaign strongly supported the new project. Mr. Nagaraja is to introduce the project today at 4 p.m. in the Center for Architecture, at 536 La Guardia Place, between Bleecker and West Third Streets. The event is open to the public. Models, computer animations and drawings will be on view at the center through mid-July, from 9 a.m. to 8 p.m. on weekdays, 11 a.m. to 4 p.m. on Saturdays. "What's obviously most exciting is the transparency," said Fredric M. Bell, executive director of the New York chapter of the American Institute of Architects, which runs the Center for Architecture. But so is the retail frontage, he said. "Broadway and Fulton is too important an intersection to have just a glass facade." Travelers follow the ramps at the Fulton Street subway station, atop which a new glass-and-steel transit center is to be completed in 2007.
:| Well...I can't tell if I like it or not by looking at this rendering but maybe I need to go to the Center for Architecture to see more of this project. But if he likes it then I think it will be good. It explains why no building was proposed on top of it. The architecture is fine, but I question the wisdom of spending $750 million and evicting 100 businesses to construct a building that won't get anyone to or from their destination any faster than before. Since when does the NYC subway system need above-ground terminals? Frankly, I could think of a lot better uses for our transit dollar. For example, the folks at Auto-Free NY have proposed that the money be spent instead on running the 6 line one more stop southbound, which would connect it to the Path trains and Fulton Street-area subway lines. Alternatively, this money could form the down payment for a JFK/LIRR link to Downtown, which would provide a huge economic lift down here. Or, this money could be used to build the first, Downtown leg (Hanover Square to the Seaport) of the Second Avenue Subway. Before all these projects go forward, it would be nice if all the regional politicians and transit authorities could get together and decide what really are the transportation priorities for New York. I totally disagree with BPC on his opinion of the necessity of the station. I think this is precisely what that station and that area needs. True, it does not move people "faster". It does however create a space and environment let's subway passengers and residents of the neighborhood feel that the city cares. To some extent, I feel it restores a sense of dignity to Mass Transit. I also believe it is important that underground mass transit pierce the surface at certain points and offer portals that are welcoming, bright and (at 100 years old) modern. That station is a mess and, given the amount of work that will be required below ground to integrate the different lines, it is fitting that in the end a crystalline entrance marks the spot of this work. I don't discount the other projects BPC cites as necessary and worthy. I believe they should be pursued and created in addition to this, not at the expense of this. I hope the "dome" has the same effect of the Reichstag dome by Foster, capturing and directing light downward. I think the concept is brilliant. Obviously one rendering can't be seen as truly representative. This is a computer-generated architectural rendering of the proposed Lower Manhattan transportation hub, released in New York Wednesday May 25, 2004. 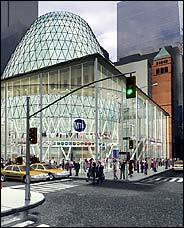 The pavillion at Broadway and Fulton St. would feature a 110-foot tall steel and glass dome as part of the design of the Fulton Street Transit Center.